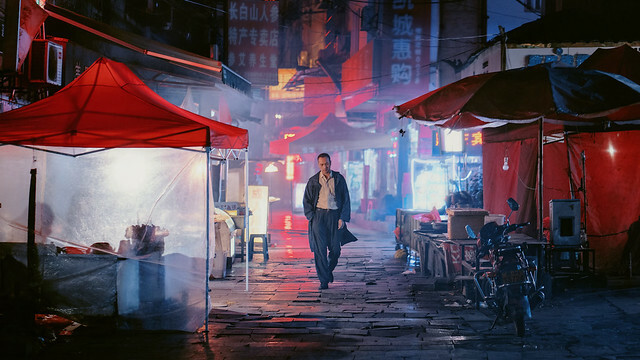 The World Park, a never ending expo/theme park in the suburbs of Beijing is the setting for Jia Zhangke's masterful take on, what else, rapidly changing China. The motto of the park is, 'you don't have to leave to see the world'. As usual Zhao Tao plays the central character Tao, a worker at the park, donning many different costumes- Indian, Japanese, African, etc and dance around on a brightly lit stage every night. All her friends and co-workers and would be lovers are transplants from rural China, trying to eke out a living any way they can. Jia patiently observes and explores every part of the changing society in episodic storytelling, reminding the viewers that behind all the garishness and excess, there are human stories hidden in there, obscured and overwhelmed by the 1/3 actual size Effel Tower, Arc de Triomphe, Piramides and camels and space ship-like karaoke bars. He leaves nothing unturned - a sad story of Russian prostitution, fake brand clothing manufacturers, construction workers working dangerous conditions for overtime pay and of course, some on/off love stories thrown in for good measure. This unhurried, soft, fine tuned, long film has many poignant moments that never turn corny. It's one of the best films I've seen in a long while.